TracPipe® CounterStrike® is a patented CSST innovation based on our existing TracPipe® CSST product, but that is engineered to significantly decrease the potential for lightning induced damage to fuel gas piping systems. TracPipe® CounterStrike® has been designed with a proprietary jacket material in place of the standard yellow jacket. This black jacket has energy dissipating properties that will help protect the TracPipe® CounterStrike® stainless steel pressure liner as well as other fuel gas system components if the TracPipe® CounterStrike® becomes energized due to lightning. TracPipe® CounterStrike® is designed to withstand significantly higher levels of lightning energy when compared to conventional TracPipe® with the yellow jacket. TracPipe® CounterStrike® has been shown to be up to 400 times more resistant to the damaging effects of electrical energy than conventional CSST. 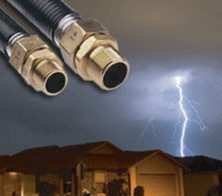 No product, including the improved TracPipe® CounterStrike® is immune to the damage caused by a direct lightning strike. Refer to NFPA 780 for lightning protection systems for buildings and building systems. There are no additional bonding requirements for TracPipe® CounterStrike® imposed by the manufacturer’s installation instructions. With TracPipe® CounterStrike®‘s improved properties, TracPipe® CounterStrike® is to be bonded in accordance with current requirements of the National Electrical Code (NFPA 70), and the National Fuel Gas Code (NFPA 54), and with any local requirements that may be in excess of the national codes. This may result in the avoidance of additional bonding costs which are required for conventional CSST. TracPipe® CounterStrike® is listed by CSA to ANSI LC 1. TracPipe® CounterStrike® meets building code requirements (ASTM E84) with respect to flame spread and smoke density. This permits installation in drop ceilings used as return air plenums, and is UL Listed for 1,2, and 4 hour through penetration firestop systems without removal of the jacket. 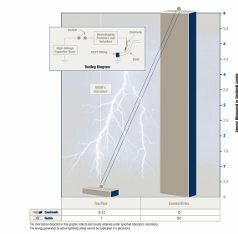 The capability of TracPipe® CounterStrike® to withstand electrical energy has once again been tested by a leading U.S lightning laboratory. The laboratory duplicated typical field damage attributed to lightning for CSST. The electrical energy level in coulombs (the amount of electricity provided by a current of one ampere flowing for one second) that was known to cause damage to our standard CSST was used as a baseline to determine the performance level of TracPipe® CounterStrike®. For an in-depth look at Technical Solutions, download the TracPipe® CounterStrike® brochure.